Keith's note: Northrop Grumman has a big Webb Space Telescope Charm offense underway. Their ads are everywhere. First they took out that huge \$200,000 full page ad in the Washington Post. Now they have a companion website using this code under ad links that pop up all over the place: http://www.northropgrumman.com/MediaResources/MediaKits/JWST/Home.aspx?utm_source=PrintAd&utm_medium=Redirect&utm_campaign=FromOrigJWSTurl+Redirect When you get to the website you are treated to nothing but happy aerospace banter. No mention of launch dates and delays, more than a decade of multi-billion dollar cost overruns, the need for Congressional reauthorization due to cost overruns, anger by NASA managers, dumb engineering mistakes, etc. 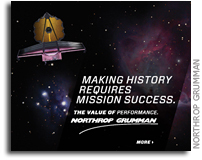 Instead, NorthropGrumman just pounds out their oxymoronic tag line \"Making History Requires Mission SUccess\". \n\nClueless Webb Telescope Advertisement From Northrop Grumman\n\n\"Northrop Grumman just wants you to know that \"mission success\" is important. Duh. I am not certain they care so long as they get paid. This is not how America is going to do that whole leadership-in-space thing. If this is an example of how we do that leadership thing we won't be able to afford to lead the way.\"
This page contains a single entry by Keith Cowing published on July 17, 2018 11:29 PM. More Turmoil At The Space Foundation was the previous entry in this blog. More Flying Rich People Will Soon Fly Into Space. Yawn. is the next entry in this blog.